Each and every year, brides-to-be wait with bated breath for leading Indian designers to reveal their wedding collection. They look to the ramp and then to the racks/tailors. It doesn’t matter whether you’re buying your wedding lehenga from a bridal couture store or getting it custom made instead – you still need to know what’s in vogue on the runway; after all, you need to be the showstopper at your own wedding! And make no mistake, you’re no less than a model and so your wedding lehenga needs to be an absolute stunner. To help you decide what style to go in for, here’s a list of lehenga designs that are trending high in 2016. 1. Layered Lehengas – With bridal fashion this season, layering is something all fashion bigwigs have been experimenting with. There are loads of options to choose from too; you can go in for an anarkali lehenga and show off your beautiful midriff or choose a jacketed lehenga for that graceful, royal look. Wearing a long bandh-galah choli that covers about a fourth of the lehenga is another style that’s been catching up. 2. Cape Cholis – You thought capes were only fashionable as long as worn at Coachella with a long skirt? Think again! A traditional choli can be tailored as a cape of any length you choose, depending on how much skin-show you’re comfy with. Such a look would be ideal for brides with a more cosmopolitan sense of aesthetics. Rest assured, cape cholis with flared lehengas make for a striking, oogle-worthy wedding outfit. 3. Mirror-Work Lehengas – Mirrors are so “in” this season. Instead of the typical zari, zardosi and embroidered pieces, there has been an unending onslaught of mirror-work lehengas in high street fashion this year. And mirror-work lehengas sure do look spectacular. Brides who love all-things-blingy, this may be the style for you! 4. Velvet And Ombre – In terms of fabrics for wedding outfits, velvet has made a comeback this season. It gives a very majestic finish to lehengas and is a great option for winter weddings. In terms of colours that have been recurring on ramps, ombre takes the number one spot. If you don’t want to be wearing the conventional reds, pinks or oranges, ombre would be a fashion-forward choice. 5. Lehenga With A Trail – Ahh, now this is one style that has mass appeal. Have a lehenga with a trail? Now that’s like your bridal fantasy combining with your princess dreams! Keep in mind though, having a lehenga with a trail may be slightly tricky to handle. It can get quite tiring to be arranging the flowing trail throughout the night. But if you’re not worried about such tiny hassles, go for it! Lehengas with trails rock! 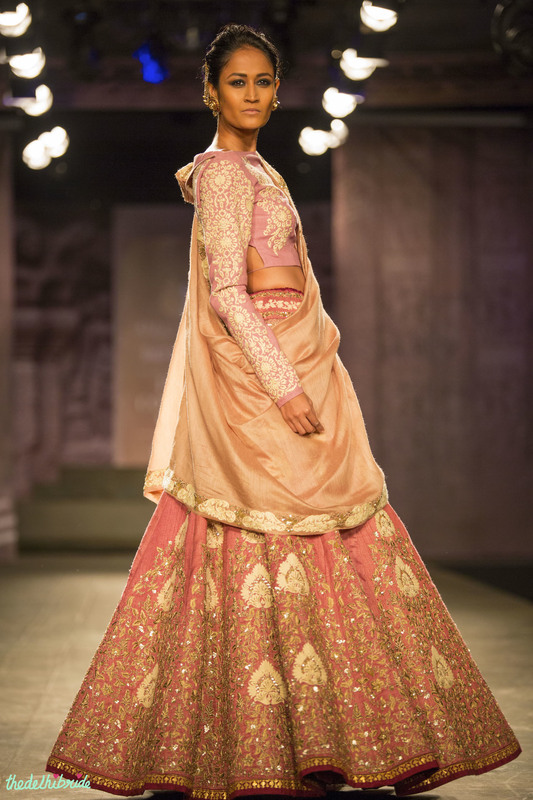 Here are some trendy wedding lehenga designs for 2016 to shop for your big Day.